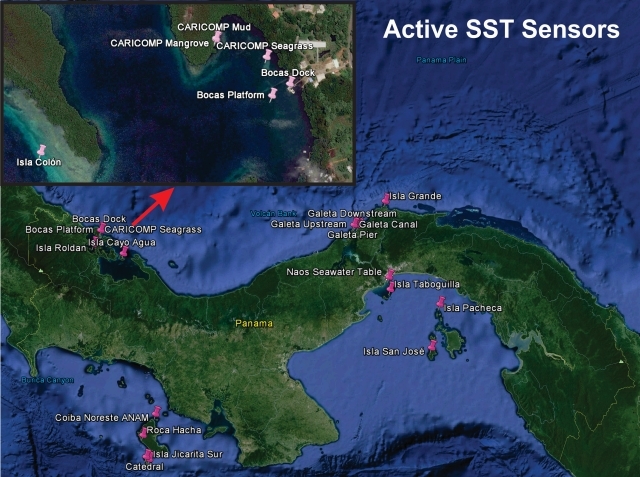 Since 1995 STRI has maintained an array of underwater temperature sensors in the Caribbean and Pacific sides of Panama. At present, we are measuring underwater temperature at 21 locations. 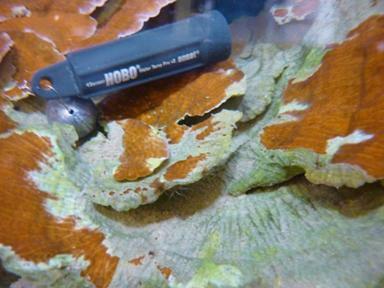 Water temperature is measured using Hobo U22 Water Temperature Pro v2 probes (WaterTemp_Hobo_U22_001.pdf) and Campbell Sci. CS 107 temperature probes (Temperature_Probe_Model_107.pdf). The Hobo sensors are deployed at remote locations and retrieved with frequencies ranging from every 2 to 12 months. The CS 107 are connected to data loggers with real-time telemetry connections to central computers. 1 Beginning in Aug 23, 2013 these data have been collected by Catalina Gomez. Please read our data use policy before using any data from this page.